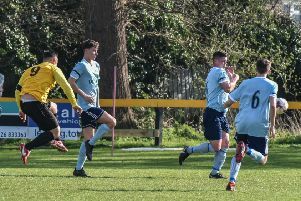 With the pitch passed playable following a morning inspection, Southam’s new manager Alex Baird sent out his side with two new signings and three youngsters from the under-18 development team. And apart from a seventh-minute slip which allowed Danny Harris to cut inside and fire low into the far corner, the Saints kept their shape well in the first half and made it difficult for the Adders to create chances even though they had the majority of the possession. At the other end, Southam had two very presentable opportunities of their own. First, Will Webster-Wall was released but his shot went wide of the near post and then Matt Omari broke clear but could only tamely hit his chip into the grateful arms of Tom McNulty in the visitors’ goal. All this changed in the 43rd minute with two moments of madness from Southam defender James Keller changed the complexion of the game. Keller scythed down Alan Miller to receive a yellow card and then from the resulting free-kick, he punched the ball clear when it was heading straight into the keeper’s hands to earn his second yellow in a matter of seconds. Alex Naughton made it 2-0 from the spot to leave the ten-man Saints with it all to do after the interval. The match was effectively over as a contest two minutes into the second half. Alan Miller passed to Louie O’Connor whose shot thumped the crossbar and Danny Harris was first to react, putting the rebound past Harry Gardiner in the home goal. The task became even harder for Southam in the 55th minute when Lee Rycroft slid in studs showing on Kyle Turner to earn a straight red from referee Tallis following consultation with his assistant. Facing just nine men, it was no surprise that the league leaders took full control. Ashley Gray ended a fine run with a fierce shot to make it four in the 60th minute and Naughton forced his way through the home defence to add his second two minutes later. O’Connor scored two fine goals in the 65th and 75th minute and Naughton completed the scoring in the 77th. It could have been worse for Southam had it not been for fine performance in the home goal from Gardiner who made a string of excellent saves including a breathtaking stop from Alan Miller, diving to his left to keep out a fiercely hit drive. Southam travel to mid-table Uttoxeter Town tomorrow before entertaining Littleton on Tuesday evening.